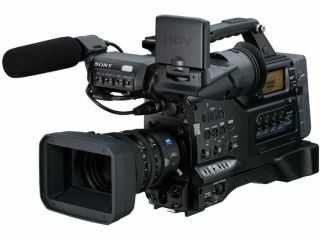 The HVR-S270U from Sony is a shoulder-mounted 1080p camera aimed at news agencies and the like. Sony's latest high-definition video cameras are clearly intended for the bottom end of the professional market, but that doesn't mean we can't dream about the 1080p beauties. The US arm of the company has updated its line of professional HD TV cameras with a handheld model that records to MiniDV tapes and a shoulder-mounted version that adds support for the more trustworthy DVCAM tapes. At $6,850 (£3,300), the handheld HVR-Z7U offers the proper lens mounts pros need for changing their optics (a 12 x optical zoom Zeiss lens is included) and a 3 ClearVid CMOS sensor that can still function in light as low as 1.5 lux. It can also record HD TV to an attached hard drive or a CompactFlash card. As for the shoulder-mounted HVR-S270U, it will sell for $10,500 (£5,070) when it arrives along with its little brother early next year. It includes all the abilities of the Z7U, but can also handle the faster DVCAM tapes and full-size cassettes too. Both cameras can down-convert to standard definition, although anyone making the outlay Sony asks for its high-def gear is bound to be pained to step down. Oddly, each of the newcomers can accept lenses made for Sony's Alpha series digital SLR still cameras.